Each Azure region is paired with another region within the same geography, together making a regional pair. The exception is Brazil South, which is paired with a region outside its geography. Across the region pairs Azure serializes platform updates (planned maintenance), so that only one paired region is updated at a time. In the event of an outage affecting multiple regions, at least one region in each pair will be prioritized for recovery. West India is paired in one direction only. West India's secondary region is South India, but South India's secondary region is Central India. Brazil South is unique because it is paired with a region outside of its own geography. Brazil South’s secondary region is South Central US. South Central US’s secondary region is not Brazil South. US Gov Iowa's secondary region is US Gov Virginia. US Gov Virginia's secondary region is US Gov Texas. US Gov Texas' secondary region is US Gov Arizona. We recommend that you configure business continuity disaster recovery (BCDR) across regional pairs to benefit from Azure’s isolation and availability policies. For applications which support multiple active regions, we recommend using both regions in a region pair where possible. This will ensure optimal availability for applications and minimized recovery time in the event of a disaster. As referred to in figure 2. Azure Compute (IaaS) – You must provision additional compute resources in advance to ensure resources are available in another region during a disaster. For more information, see Azure resiliency technical guidance. Azure Storage - Geo-Redundant storage (GRS) is configured by default when an Azure Storage account is created. With GRS, your data is automatically replicated three times within the primary region, and three times in the paired region. For more information, see Azure Storage Redundancy Options. 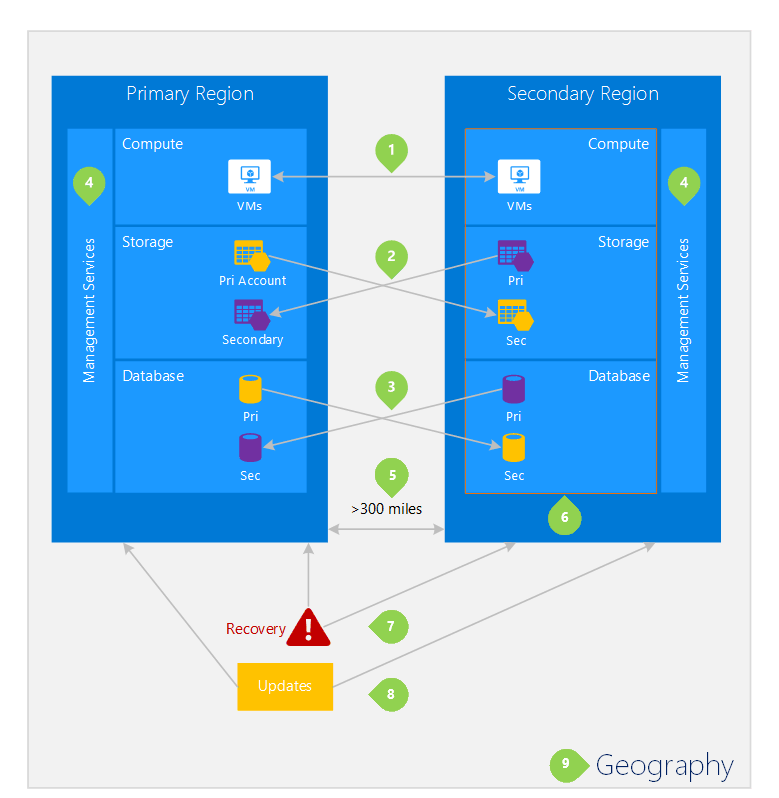 Azure SQL Database – With Azure SQL Database Geo-Replication, you can configure asynchronous replication of transactions to any region in the world; however, we recommend you deploy these resources in a paired region for most disaster recovery scenarios. For more information, see Geo-Replication in Azure SQL Database. Azure Resource Manager - Resource Manager inherently provides logical isolation of components across regions. This means logical failures in one region are less likely to impact another. 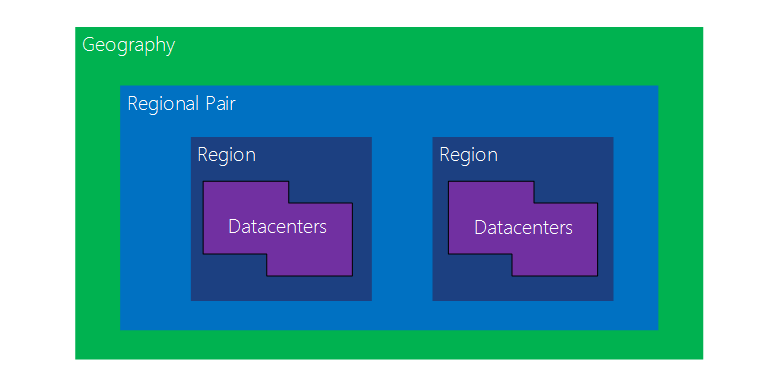 Physical isolation – When possible, Azure prefers at least 300 miles of separation between datacenters in a regional pair, although this isn't practical or possible in all geographies. Physical datacenter separation reduces the likelihood of natural disasters, civil unrest, power outages, or physical network outages affecting both regions at once. Isolation is subject to the constraints within the geography (geography size, power/network infrastructure availability, regulations, etc.). Platform-provided replication - Some services such as Geo-Redundant Storage provide automatic replication to the paired region. Region recovery order – In the event of a broad outage, recovery of one region is prioritized out of every pair. Applications that are deployed across paired regions are guaranteed to have one of the regions recovered with priority. If an application is deployed across regions that are not paired, recovery might be delayed – in the worst case the chosen regions may be the last two to be recovered. Sequential updates – Planned Azure system updates are rolled out to paired regions sequentially (not at the same time) to minimize downtime, the effect of bugs, and logical failures in the rare event of a bad update. Data residency – A region resides within the same geography as its pair (with the exception of Brazil South) in order to meet data residency requirements for tax and law enforcement jurisdiction purposes.